BITSAT 2015 Forms Now Online - Hurry Apply Soon! Application process for BITSAT 2015 has now started. Students seeking admission in BITS Campus at Pilani, Goa and Hyderabad should fill up this form. 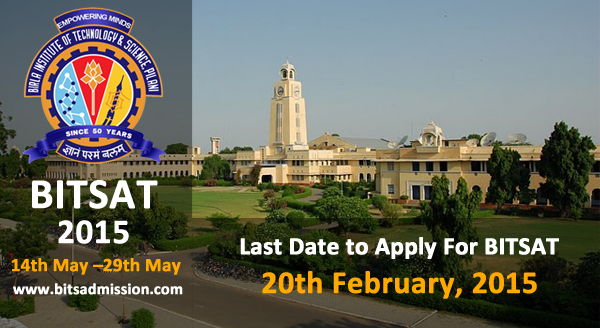 A candidate can apply online only once for BITSAT-2015. However, if a candidate discovers any mistake in the form submitted by him, he can apply online second time and send a letter to admission office BITS, Pilani mentioning the earlier application number which will be cancelled. In such cases, the second application has to be accompanied by a fresh application fee. Join more than 1 Lakh students preparing for Engineering in 2015 on simplylearnt.com.